Built in 1855; used as a storeroom for landlord's share of Panna Maria crops. 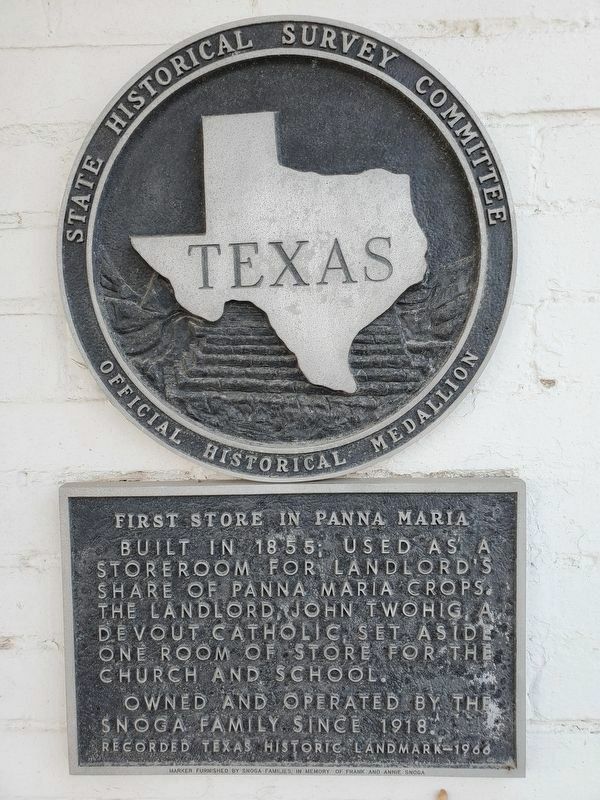 The landlord, John Twohig, a devout Catholic, set aside one room of store for the church and school. 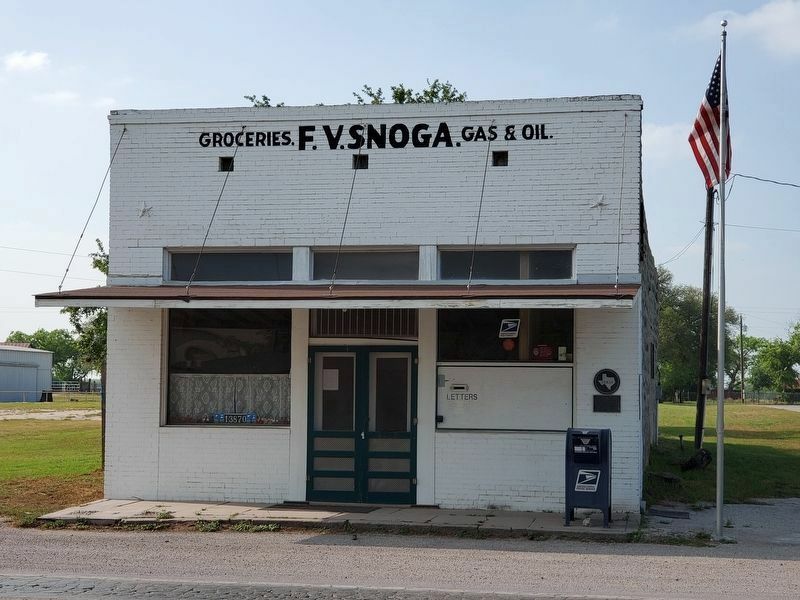 Owned and operated by the Snoga family since 1918. Location. 28° 57.447′ N, 97° 53.937′ W. Marker is in Panna Maria, Texas, in Karnes County. Marker is on Farm to Market Road 81, on the right when traveling west. Touch for map. The building now serves as the Panna Maria Post Office. Marker is at or near this postal address: 13870 FM 81, Panna Maria TX 78144, United States of America. Touch for directions. (within shouting distance of this marker); Immaculate Conception Church (about 300 feet away, measured in a direct line); St. Joseph's School (about 600 feet away); Nativity of the Blessed Virgin Mary Catholic Cemetery (approx. 4.1 miles away); Nativity of the Blessed Virgin Mary Catholic Church (approx. 4.3 miles away); El Fuerte del Cibolo (approx. 4.3 miles away). Touch for a list and map of all markers in Panna Maria. More. Search the internet for First Store in Panna Maria. Credits. This page was last revised on April 9, 2019. This page originally submitted on April 9, 2019, by Brian Anderson of Kingwood, Texas. This page has been viewed 45 times since then. Photos: 1, 2. submitted on April 9, 2019, by Brian Anderson of Kingwood, Texas.